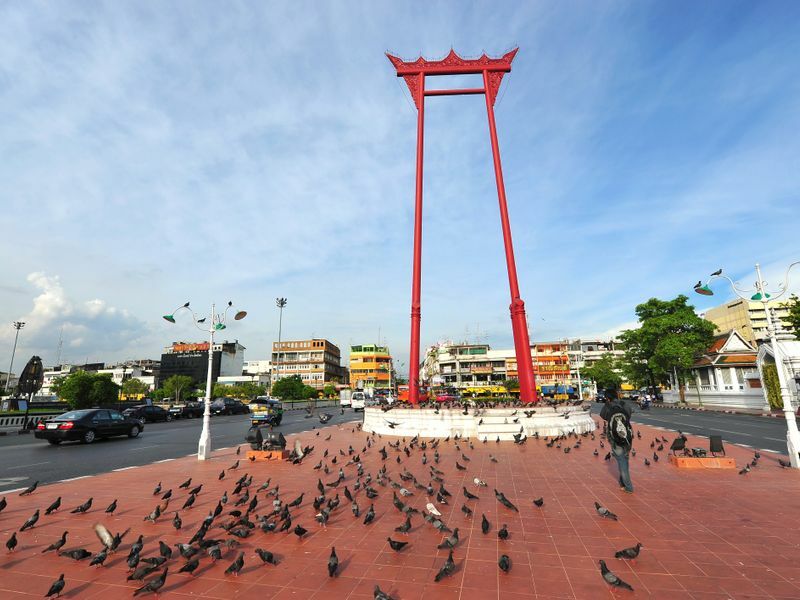 The Giant Swing (or locally called Sao Chingcha) is situated in the old town area of Bangkok. The swing was built for a religious purpose (Hinduism). It's located in front of Wat Suthat Temple. The Giant Swing was formerly used in an old Brahmin ceremony. 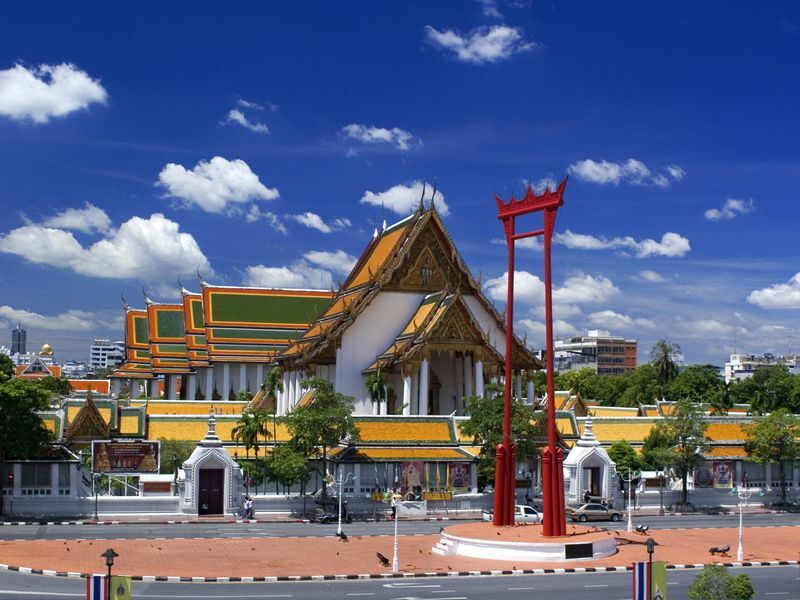 It now becomes one of the most popular Bangkok's landmarks. The Giant Swing was built in 1784 by King Rama I - the early establishment of Bangkok. The ceremony was held by putting a Hindu priest on the swing to welcome Isara down to the earth. The following reign of Rama II discontinue to the swing ceremony as it perceived as inoperatable due to damages caused by the lightning. Later on in 1920, the swing was renovated and moved to its current location and the ceremony was revived for another 15 years before it was indefinitely discontinued after several fatal accidents. The swing was renovated in 1959 until the wooden pillars were appearing some of the serious damages for serving for 45 years. In 2005, the government initiated to renovate the swing the dedicate for the royal ceremony which was to occur in 2007 using teak tree trunks in the process. Two of which were used to maintain the structure of the swing. They were extremely tall as of 35 metres. The rest were used for support. The timbers of the original swing are currently stored and partly exhibited at the Bangkok National Museum. UNESCO was showing interest the whole scene of the Giant Swing and Wat Suthat Temple in Backgrounf and eventually norminated it the Heritage Site in 2005. In the background besides Wat Suthat, there is nearby the Lan Kon Mueng (People's Plaza) located in front of Bangkok Metropolitan Authority Building which is sometimes served for holding activities and allowed parking lot underneath. A bit further to the west, you can visit the famous Mont Nomsod cafe where sells exclusively milk and toast of various toppings. The tour around the Giant Swing itself should take 5 minutes max. 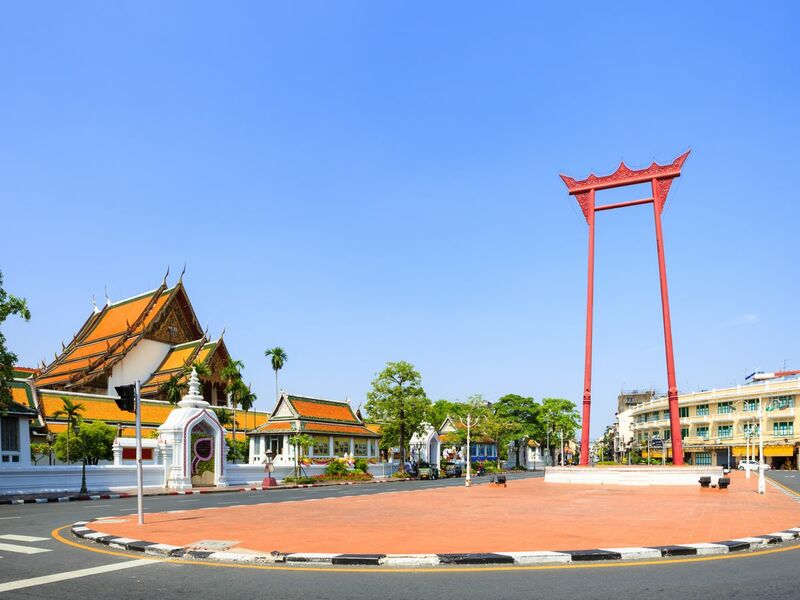 But feel free to wander and explore the neighbourhood such as Wat Suthat, Mont Nomsod cafe, and Buddhist-related product shops such as Buddha Statues, monk alms, offerings, etc. It's simply a fascinating sight to see!